Hemkund Sahib Yatra (Tour) 2014 Start From Today:- The Hemkund Sahib is one of the famous, Holy Place and Gurudwara of the Sikh Religion. It is situated at the elevation of 4329 Meters. Every year many peoples are came to visit the temple or Gurudwara of the Hemkund Sahib. 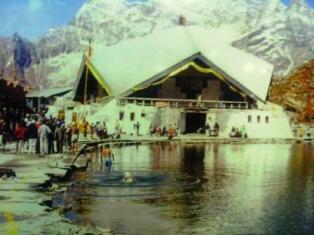 So after Six months the Hemkund Sahib is open from Tourist. And the tour from Hemkund Sahib is started from today 25th May 2014. Today 50 Sikh Peoples are started the Holy trip of Hemkund Sahib. And also many other peoples are joining the trip of Hemkund Sahib. The Hemkund Sahib is located 19 Km from Govindghat on Badrinath Highway. And it is situated in the Chamoli District of Uttarakhand State. The Valley of Flowers is also situated near the Hemkund Sahib. Due to Last year Uttarakhand Flood Tragedy many of tourists was not visited the Dham, so this year many of tourists are going for the Holy trip of the Hemkund Sahib. So we are wishing you a happy and safe journey.